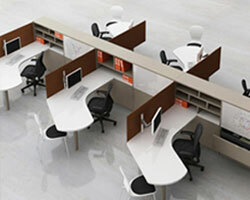 Focusing on the artful contrast of structure and materials, Dividends Horizon offers pragmatic new planning and aesthetic opportunities for individual and linked workstations, using new furniture elements that reflect contemporary work styles. Currents Fence creates dynamic, flexible work environments that support teamwork, collaboration and open communication. 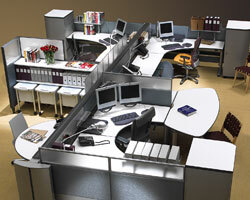 Fence integrates with all Knoll office systems to add advanced technology management and greater planning flexibility. Cultivated. Timeless. 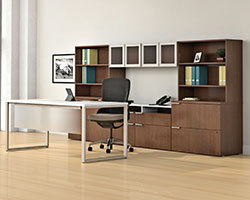 Reff combines clean lines, rich textures and solid wood craftsmanship to bring a classic aesthetic to the workplace. Distinguished, classic, efficient and progressive. Reff capitalizes on the spirit and beauty of wood with dovetailed wood drawer interiors, four drawer pull options and a rich palette of natural and Techwood finishes. 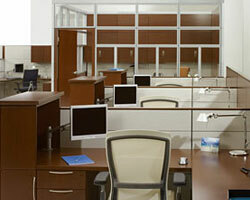 Natural wood veneers are all hand selected for quality and consistency of color. Template is a storage system that consolidates a range of storage options, defines space in the open plan environment and creates efficient open plan and private offices. 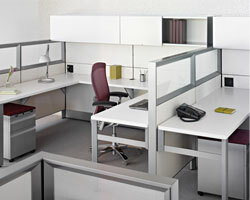 Voi desking from the HON Company not only offers desks and storage solutions for every application, it also presents an integrated design for the entire workplace. Voi’s layered worksurfaces, practical storage components, versatile materials and compact footprints can be personalized to achieve the right mix of functionality and style.